I snatched up The Smashing Pumpkins’ Gish and Siamese Dream reissues released last week and have thoroughly enjoyed revisiting two seminal albums of my generation. It’s amazing what a little time and distance can do when it comes to considering music. We’re years removed from the videos and the hype and left only with the music. It was exhilarating being reminded how forceful they were and experiencing how well this music stands up all these years later. Pop culture started to abandon the Pumpkins as the original lineup of Billy Corgan, James Iha, D’Arcy, and Jimmy Chamberlain splintered after the massive success of Mellon Collie & The Infinite Sadness (can’t wait for that re-issue, but all in good time). 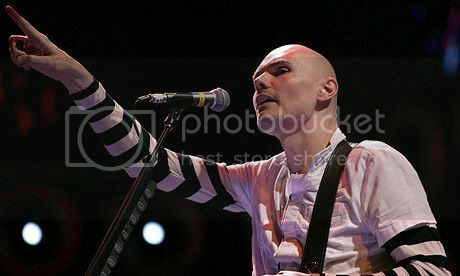 Subsequent records sold less and less and Corgan later disbanded the Pumpkins to form a new band, Zwan, and record a solo album before reforming the band with himself, Chamberlain, and a couple new members to carry the music forward. Zeitgeist was released in 2007 to relative indifference, and it annoys me. I liked Zeitgeist then and still do. “Doomsday Clock” is one of my favorites from the record. It has all the Pumpkins’ signature sounds, even without James and Darcy. There is layer upon layer of guitar and the propulsive drumming of the underrated Jimmy Chamberlain. There’s also the unmistakable, compelling, thin voice of Corgan, riding the razor’s edge of being too nasally to withstand. This live performance of “Doomsday” was professionally filmed in May 2007, prior to the album’s release. Do yourself a favor, kids. Grab the re-issues and revel in the cornerstone work of one of the great bands of the ’90s and then pick up a copy of Zeitgeist. Corgan still hasn’t run out of ideas.